What Is the Real Nature of a Man or Woman? I think that you can only grow into what you already believe yourself to be. So if one's concept of one's self is limited, we walk through the years of our life also limited. There's a widespread idea within some religions, and I was prey to it too at one time, that we, each of us individually, "evolve". In the sense that ages ago we may have once been a lifeless speck of dust, or a beetle. You can't ever become something that you are not already. Spiritual growth, IMHO, is becoming what we always have been anyway. And we have never been a beetle or a grain of dust. Our God-Being expands into itself. That's the real nature of the spiritual Path. We do not "grow" or "evolve" or "change". That's a limited mortal concept. We do not miraculously transform into something that we are not already. No. We express and outpicture that which we already are. Just as the fallacy in the Old Testament portrayed an "angry God", separate from man or woman, and this was a concept of God riddled with error, yet people believed it. Jesus came to correct this error. Same with the widespread Hindi and New Age idea of a human being today. In the same way, the Hindi and largely-accepted New Age idea of what a man or woman is at core is and always has been an error. 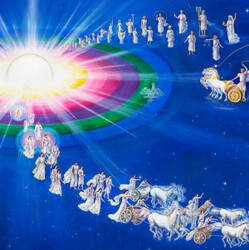 Though the truly attained always felt the Truth: they knew that they had been God from the beginning. Where in his words, for example, do we find Jesus saying that he was once an ant or a grain of sand? We are God-Beings now. We always have been, and it is how we began. There never, IMHO, was a time when we were not God-Beings. We never were stones, or bits of grit or mud, or slugs, or centipedes, or "evolving" into whatever - rabbits? Voles, adders? Wolves or dogs? Seals? No - this is a long-running superstitious error in spiritual thought. It is superstition because it is believed whole-heartedly, just like many other erroneous religious beliefs, yet it isn't actually true. It doesn't matter if billions of people believe a superstition - they nevertheless believe in a superstition. Matter changes, yes. Elemental life may appear to "evolve". But human beings are not and never have been a part of evolution. It's why there exists that darn "missing link" - always missing because the "link" between ourselves and apes doesn't exist and will never be found. This concept that humans have not "evolved" is a vital part of the Coming Golden Age. Because a Golden Age depends upon a right belief about the nature of what a man or woman really is: our self-concept and how we view ourselves. Once we know and remember what we really are - and always have been - then we can start to outpicture that now. If we believe and take on board that we have ever been, or are now, less than a God-Being, and just "evolving", then we'll get stuck in that trap of superstition all our lives. Isn't it the greatest comfort to know that we are not being called to become something that we are not already in truth? Our spiritual Victory unto Perfection is not something we truly have to strive for, in one sense. (Yes, we sweat and make mistakes while embodied.) But what we really are already exists in Eternity. That's the real meaning of maya or illusion. We tend to believe and accept that time and space are real, and their limits are real. But in reality there's only Eternity. We are already the God Beings that human beings erroneously believe they have to "evolve" into. Behold: You are The Temple of the Living God!